Discussion in 'Professional Football' started by Buckskin86, Dec 21, 2009. Hueytown quarterback Jameis Winston is almost certain to be a prime target for major league baseball scouts in 2012. As a pitcher for the Golden Gophers, Winston hit .424 as a sophomore and went 8-3 on the mound with a 1.92 ERA. Winston, who is being re*cruited nationally even be*fore his junior season by the likes of Alabama, Florida, Miami and Ohio State, has two requirements for col*lege suitors: They will let him play baseball, too, and he wants to attend a school with a strong podiatry pro*gram. Baseball scouts have al*ready checked out Winston in person, with one saying recently that if he continues to progress he will be an early-round draft choice as a high school senior. That means a big finan*cial offer, which could com*plicate his college football commitment. If you want to get in touch with Jameis Winston, you'd better get the number from him. After all, his cell phone is constantly changing. Oh, by the way, he'd better know why you are calling. "He has to change his cell phone number all the time," Hueytown coach Matt Scott said. "It's amazing how many people call and try to get to him. Our rule is that if someone he doesn't know calls him, he has to tell them to call me. No exceptions." "It's funny, but hardly anyone follows up and calls me." Winston is a high school junior, but not any ordinary junior. He could be the nation's top rated quarterback prospect for the Class of 2012 when his senior season rolls around. Why? Start with his size: 6-foot-4, 195 pounds. Think Cam Newton before college. The University of Alabama has offered 10 juniors from the in-state ranks which includes Scout.com National 100 members Kwon Alexander, five-star linebacker from Oxford High School, Jameis Winston, four-star quarterback from Hueytown High School, Justin Shanks, four-star defensive tackle from Prattville High School, Reggie Ragland, four-star linebacker from Bob Jones High School in Madison and Chris Casher, four-star defensive end from Faith Academy in Mobile. 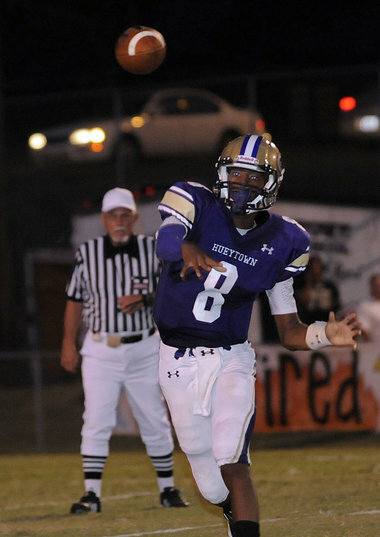 Jeff Sentell, Birmingham News, December 09, 2010 10:59 a.m.
Of all the prep quarterbacks in America - that's something like 18,000 guys who will start for their teams next fall ' the best one plays for Hueytown High. That's according to national recruiting expert Tom Lemming. Lemming rated Hueytown junior Jameis Winston the nation's top quarterback in his 2012 rankings. "He's got Cam Newton-type ability," Lemming said on the air last week on CBS College Sports Network. The 6-foot-4, 190-pound Winston was the nation's No. 4 prospect overall in Lemming's junior rankings. By Bone...Clemson and OSU have been at his school this week...OSU will definitely get an official...Nebraska recently offered...Alabama and Florida State are recruiting him the hardest. Video by The Bank....Talks about his experience at the Elite 11 Camp yesterday & his interest in Ohio State, LSU & Florida State. Despite being from Alabama, he grew up an Oklahoma Sooner fan. Will be visiting Ohio State today and LSU next week. Is he less of an Alabama lean then people first thought? Based on the video alone, he seems wide open & has definite interest in Ohio State. Jameis was very impressed with tOSU but is taking it slow with his recruiting. He notes tOSU's history of recruiting black quarterbacks and is looking for a school where he will have an early opportunity. By The Bank, interview with Winston's high school coach.....Discusses the visit to Ohio State over the weekend. Talks highly of Coach Tressel & Coach Siciliano & will possibly return for an official visit for the Wisconsin game. Everyone wants to know everything about Jameis Winston right now. representing insatiable message-board millions and old-fashioned reporters. The Hueytown rising senior is rated the nation's No. 2 quarterback by several services. The baseball prospect is a potential high draft pick in the 2012 First-Year Player Draft. Is he going to Alabama or Auburn? Do Florida State and LSU still rate highly among the eight programs he's considering signing with next February? Those sound like dreams, but they also rob him of sleep. "All I think about right now is making the decision and getting it over with," he said. When that's finally done, the wonder is if he'll ever play on Saturdays. The next decision will be whether to become a pro baseball player with a seven-figure signing bonus to skip those dreams. Winston is intelligent. He's composed and normally genuine, but there's a new weight on his shoulders. He used to say definitively he was heading to college to play both no matter what. "There's a good chance I might have to make a decision between playing those sports in college and pro baseball." he said. "I've got a big summer ahead where I'll be playing more baseball than football. This is the most important baseball summer I will go through." "Me going to Ohio State put in my mind that I'm not ready to make a decision yet," Winston said. "I really liked it there. I was like, 'Dang, if I never would have came to Ohio State I would never have known what it was like'. It's a great place. I was glad I made that trip." Childhood favorite Oklahoma finally came with an offer. He wants to see if Texas has any interest, too. He got the chance to visit with Ohio State quarterback Terrelle Pryor on that Columbus trip. Pryor was the nation's top-rated player in 2008. He had to choose between basketball and football. The athletic comparisons between the two are obvious. "He went through all this attention worse than me as the No. 1 guy." Winston said. "He told me not to get fed up with it. He said I don't have to tell anyone where I want to go but to just know myself where I wanted to go. He also gave out the pros of going to Ohio State."